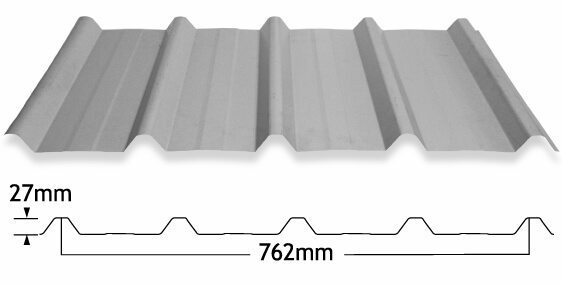 Five rib roof sheeting is a great sheeting option for all your roofing and walling needs in Brisbane. Made for a wide range of applications across domestic and commercial projects, five rib roof sheeting has a range of great benefits. Five rib roofing is made to last and is well known in the roofing industry for its versatility and reliability. It is tough, cost-effective and superb for design purposes. Our five rib sheeting is available in our wide range of Colorbond® Steel colours and Zincalume® made from Australia’s own Bluescope Steel. Go flexible with Five Rib – Five rib roof sheeting is a high tensile roof and wall sheeting product. Choose the roof and wall solution that adapts to your needs. Easy to install – Five rib roof sheeting is strong, yet lightweight, making it easy to use and easier to install. Get the best value and don’t sacrifice durability or simplicity. Industrial ready – If you need five rib sheeting for industrial applications then you’re in luck. Five rib is widely used for industrial applications, making it a great product for your next job. Made to withstand the weather – When it comes to roofing supplies in Brisbane or Queensland, you need something that can withstand extremes. Five rib sheeting has great weather resistance qualities, whether it’s for rain, hail or shine. Queensland Sheet Metal cut five rib sheeting to length to suit your requirements; large or small. Available in base metal thicknesses of either 0.42 or 0.48. Read our article and see why you should choose metal roofing – 5 great advantages of sheet metal roofing. For detailed information on the five rib sheeting, please view or download our five rib brochure below. Five rib sheeting should be laid facing the prevailing wind. Ensure that each sheet has a good, accurate join to previously laid roof sheet. Look out for gaps; ensure each sheet is carefully laid. Five rib sheets need to be laid with appropriate support spacing to ensure a strong join. Do not bend or otherwise stretch sheeting, which may allow in water and wind. Ensure sheeting is weather proofed and properly sealed. Also ensure the overlaps are secure, particularly during roofing work. Flashing turn downs on five rib sheeting should be notched tightly around the rib to ensure maximum weather tightness. Pan fixing for five rib is only recommended for applications such as carports or patios, when weather tight roofing is not essential. Side lap fasteners need to be secured in the mid-span when spans exceed 900mm for roofing or 1200mm for walling. Secure with appropriate fasteners as per descriptions below. At the end of the roof sheets, the pans should be turned up at the crest of the roofing and down into the gutter. Contact us any time to make an enquiry, a purchase or to simply learn more about our products. Call 1300 926 074 today.